Mk2f coupe dash pod removal. So i recently got a VW polo 6n 1.2 3 cylinder. It come with 2 keys and both have a button in the middle of them, but they don't do anything? Anyone know what they are for? As I've tried using them for the central locking but nothing works. I also changed the batterys in them both and still nothing? mk2 1.4 8v conversion, help needed! johno1313 posted a topic in Where's my old car? Hi, I recently changed my oil pressure switch originally it was flashing with the ignition on (car wouldn’t start at this point), so now with the new switch - no flashing on ignition. However now it runs to some extent the oil light is flashing when the engines running, I did just change the oil filter today so was wondering if this could be something to do with it or how could I stop it? Cheap sensor? Thanks! VW Polo r-line 2014 help!!! 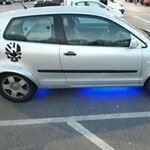 I own a vw polo r line 2014 petrol 1.2, i want to install hid lights but don't know if the lights are different to normal polo's. Also, where could i get a replacement splitter. hey polo peeps!! I've fitted 6n2 GTI hubs onto my 6n2 1.4 8v and now the wheels are toed in massively ! the hole for the track rod end to go into is 10mm closer to the steering rack than the 1.4 hubs and I've now been 2 weeks without my only car trying to figure it out. so far the only solution myself and the mechanic at the garage doing it while I'm at work have is to put threads further up the track rod and chop the ends off to make it fit but surely there's something were missing ? some part that needs changing???? I'm at a loss and I want my car back from what shouldve been a 20 minute job ? anybhelo appreciated- we've checked ball joints, track rod ends, checking wishbones soon but everything seems to be the same !!! After some advice really the bottom end has gone on my g40 so I’m just curious of what options I have as to which replacements I can put on.i could quite easily Just replace the 2 knakard pistons but it’s going to be a major task to find them.so I’m looking at just putting a different bottom end on just instead.so if anyone can help please let me know thanks. My car has some rust under the black plastic that is glued to the car, does anyone know how to get the plastic bits off and back on so I can remove and fix the rust? Any tips on getting rid of the rust would be great too - it's only surface rust thank you.